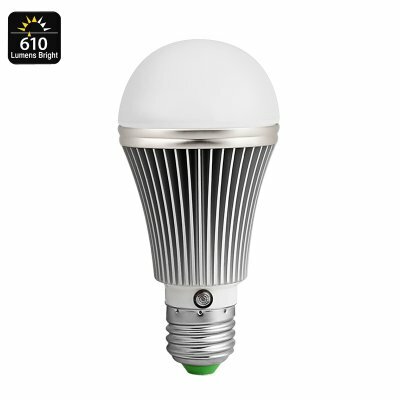 Successfully Added 5 Watt E27 LED Light Bulb - 610 Lumen, Light Sensor, 14 LEDs, 4000K Color Temp, 25000 Hours Life to your Shopping Cart. Emitting 630 lumens this energy saving bulb emits about the same about of light as a 50W incandescent bulb but only uses a fraction of the power. This means you get great lighting at reduced costs which is good for your wallet and the environment. Compatible with E27 light fittings this LED bulb has a 4000K light temperature that brings a natural white light so it is suitable for homes and workplaces alike. Comprised of 14 LEDs this LED bulb gives great coverage and features a built in light sensor. This allows it to turn on or off as needed throughout the day when depending on the ambient light. Placed outside it offer great lighting to your porch, patio or garden and save you money by automatically switching off when not required. With its 25000 hour estimated life span this LED bulb will more than make up for its modest price with great savings on your electric bill over the years so you're sure to notice the difference and can even do you bit for the environment at the same time. This E27 5W LED Light Bulb comes with a 12 months warranty, brought to you by the leader in electronic devices as well as wholesale LED Lights..